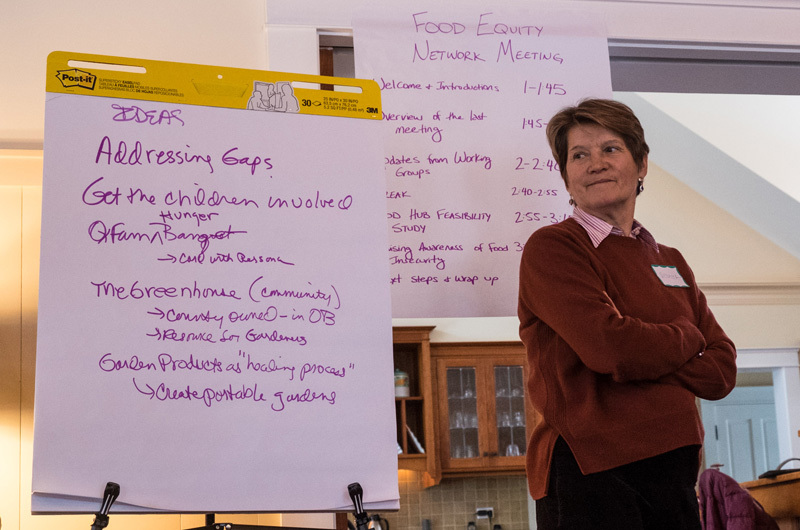 Rebecca Haag, Island Grown Initiative executive director, speaks at recent food equity summit. 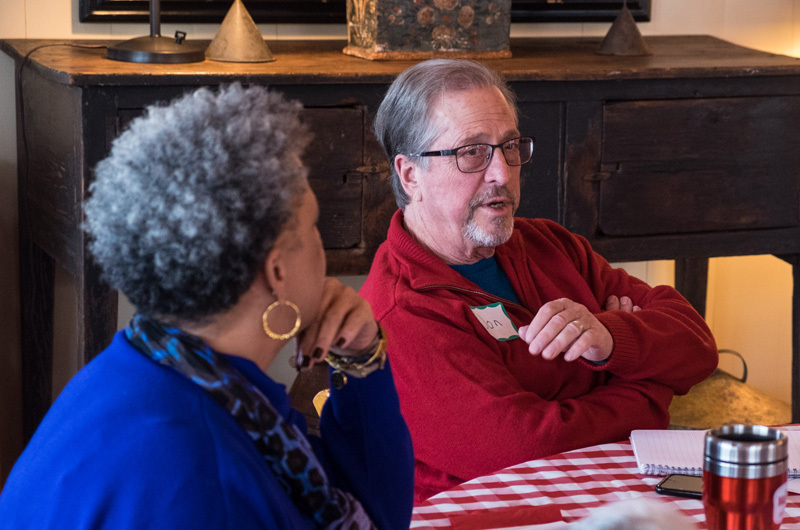 The campaign against hunger on Martha’s Vineyard has mobilized chefs, business owners, social service agencies and community activists, who first gathered in October for a food equity summit to focus on the problem of getting food to all the Islanders who need it. 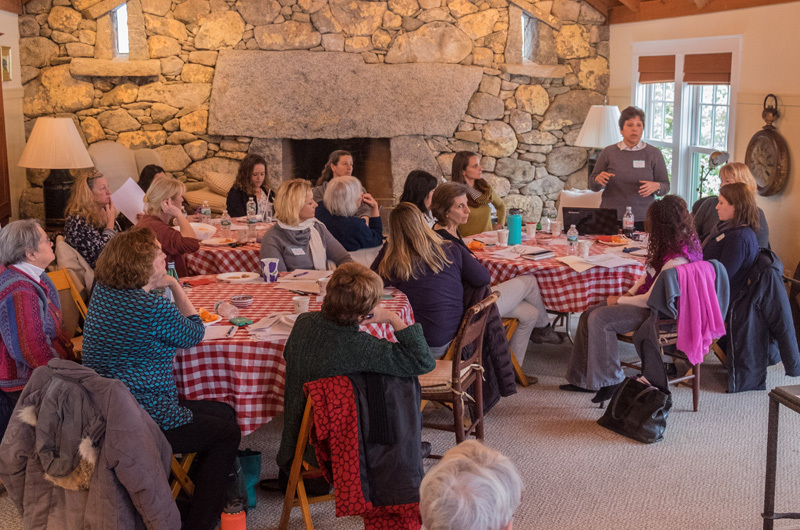 On Tuesday, a follow-up meeting drew about 30 people to a private home in West Tisbury to report on their progress, plan the next steps and share ideas for the future. With more than a quarter of the Vineyard’s schoolchildren eligible for free and reduced-price lunches, feeding children and families is a clear priority for the group. But the Island’s rapidly-aging population means many low-income seniors also suffer from food insecurity, the group said. And the answer isn’t necessarily fresh, local, healthy foods, cooked at home. Many older Islanders “grew up living on canned foods,” said Betty Burton of the Vineyard Committee on Hunger. “They don’t want fresh vegetables. They don’t know what to do with them,” she said. While senior nutrition remains a gap to be closed, there has been some progress in feeding younger Islanders. A menu makeover at the Martha’s Vineyard Boys & Girls Club has led to a startling jump in membership, director Jessie Damroth told the group. About 135 children a day now come to the Boys & Girls Club after school, Ms. Damroth said. Most attend public school in the six Island towns, but some home-schooled children and students from the Vineyard Montessori School have also joined the club, which last fall did away with a former policy of charging for snacks and replaced it with a program of healthy meals. “We’re done with Jello and Yoplait,” Ms. Damroth said. Instead, the club is serving free, freshly-cooked dishes such as meat loaf, macaroni and cheese, and salads. The result, Ms. Damroth said, has been fewer temper tantrums and other conflicts among her elementary-school-age children. “They’re not fighting as much. They’re happier. They’re trying new things,” she said. A total of $35,000 in donations from the Teddy Bear Suite fundraiser, held at the Harbor View Hotel during Christmas in Edgartown, is funding the club’s new meal program, and chefs from around the Vineyard have volunteered to cook. “We’ve had a group of about 20 chefs come forward,” Ms. Damroth said. The club also accepts food donations. ArtCliff Diner owner Gina Stanley, who cooks the after-school snacks once a week, underwrote a free mini-farmers market in December that sent families home with fresh vegetables from Morning Glory Farm. At Tuesday’s network meeting, Farm Institute director Jon Previant pledged a monthly gift of 50 pounds of burger meat from the Katama Farm cows. “Tell Gina to call,” he said. Food insecurity affects older Island children as well. Chef Joe Capobianco of St. Augustine’s Catholic Church said a privately-funded “backpack program” that sends kids home from school on Fridays with a backpack full of food for the weekend has expanded from its pilot at the Oak Bluffs School to include the high school as well. “We’re working with the counselors and nurses at each school to establish the need,” currently about 20 students at each campus, Mr. Capobianco said. A planned government-funded summer food service program for school-age children still needs a sponsor, said Noli Taylor of Island Grown Initiative’s Island Grown Schools. Potential meal sites include the Oak Bluffs library, the Boys & Girls Club, a site in Aquinnah and at the Morgan Woods housing complex. But even when school is in session, hungry kids don’t always get to eat all of the food provided to them, Ms. Taylor said. Ms. Taylor said she is meeting with teachers this weekend to talk about expanding the time for lunch in schools. She also told the group that the Island Grown Initiative’s Harvest of the Month campaign will soon go multimedia, with a cooking show on MVTV to demonstrate how seasonal produce can be prepared at home. Other projects the group has underway include a guide to all the places and times for food distributions and community meals on the Island. So far, a spreadsheet has reached more than 20 entries. The information will be used to create a map that can be printed or viewed online, with a mobile-friendly design, said Sally Rizzo, who has been working on the spreadsheet with Margaret Hannaman of the Island Food Pantry. A $50,000 study, funded equally by a grant from the Vision Fellowship and a private donation, is researching the Vineyard’s food infrastructure, including farmers, fishermen and resources such as commercial kitchens, IGI executive director Rebecca Haag said. “We need to have the data first,” before developing new programs, she said. The results of the study are expected in June. Tuesday’s gathering was also a time to kick around some new ideas. Esther Laiacona proposed an Island food closet, where residents with limited storage space could keep bulk ingredients and food preserved at home. Jen Randolph of the Women’s Center in Aquinnah asked about growing food in portable gardens, while Mr. Previant offered to make land available for food garden plots on the Farm Institute’s 200-acre Katama Farm. “We’re trying to find ways to share it more with people who need it,” he said. Others observed that Islanders at risk of food insecurity are often working multiple jobs and may also have limited transportation options, making it difficult for them to commit to tending a garden away from home. Tuesday’s three-hour meeting is likely to be the last summit until the fall, at which time Ms. Haag suggested they will look back to “see how we’ve done.” She also had some post-election thoughts on the future course of the coalition. “What we’re really talking about is social justice,” Ms. Haag said, adding that food insecurity is inseparable from housing insecurity and immigrants’ rights. The community garden plot suffered from neglect of time and energy, so one smart guy organized volunteers to build keyhole gardens in participants yards, in effect bringing the garden to them. It's been great for the entire town. Mary, I am confused about why the community garden plot suffered from neglect if there is a definite hunger problem here. One would think that people would be glad and thankful for a plot of land to grow food on that does not have to be purchased. Any answers, anyone??? I think Mary was talking about the community garden in her town in Texas. But this article stated that low-income folks who work long hours at low-paying jobs may have trouble finding time to travel to a remote garden and may also have transportation issues (ie an older unreliable vehicle, a shared vehicle or no vehicle at all).